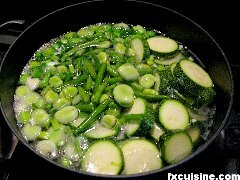 In Provence and Liguria (Italy) housewifes prepare a delicious traditional summertime soup served with pesto. 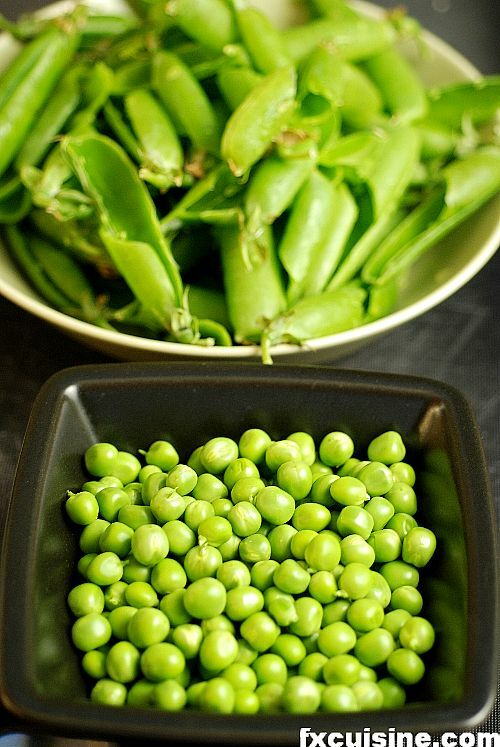 This veritable ode to glorious summer vegetables is prepared in many different ways. 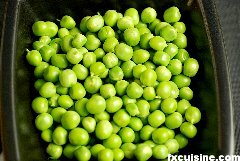 The most basic Italian version, Minestra Genovese [meenaystrah jaynovayzay], boils potatoes, peas, some onions, olive oil, garlic and a few herbs. Waverly Root writes in his Food of Italy about a minestrone alla genovese containing not only all the ingredients mentioned above but also squash, cabbage, zucchini, fava beans, red beans, string beans, a ripe peeled pitted tomato, diced eggplant and celery with a choice of pasta to a add to the soup just to make sure it is thick enough - vermicelli, maccheronicini rigati, ditalini or penne. But the reason behind this soup's cult following is of course the pesto. 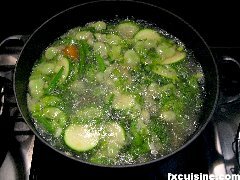 When you mix the pesto into the soup the cheese fat melts and dilutes into the broth, turning it into the most marvellous jade-colored liquid. A miraculous elixir of long life. You really feel like you rejuvenate by one year for each bowl of this soup you flush down your intestine. 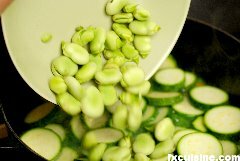 Too many cooks will spoil the pesto soup and you can make a successful and memorable pesto soup with a number of vegetables. Just buy those you can find that are beautiful the day you decide to try it and follow my instructions and you won't fail. 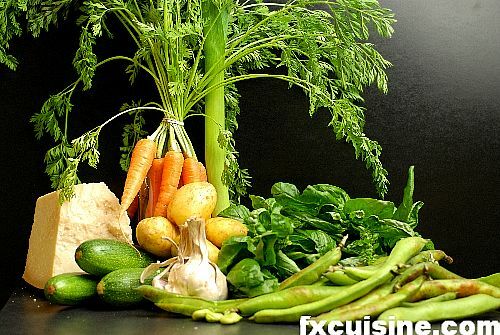 No two pesto soups use the same vegetables. 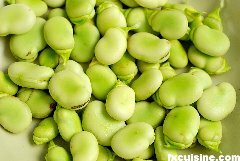 There are but a few days in the year when you can get fresh fava beans, peas and green beans all at the same time, and the rest of the vegetables all have their own cycles. 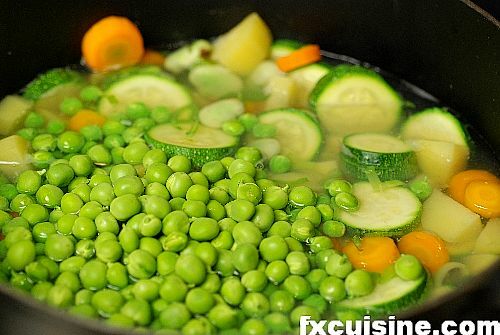 I recommend you use only the very best vegetables you can find and forget about those which are on my list but did not make it to your local market the day you finally decided to try this legendary soup. 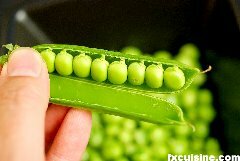 Shell the green peas - great fun to do with the kids! 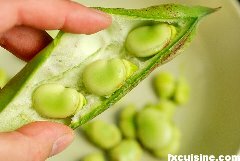 I used to do it with my grandma who grew them in her garden. 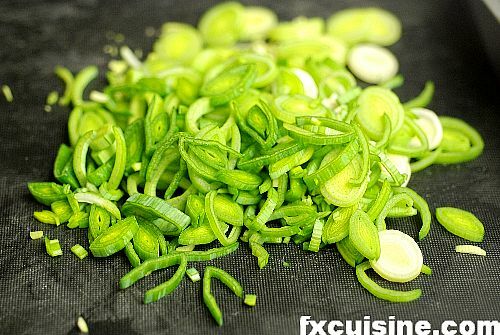 Remove the damaged leaves of the leek, clean and slice thinly. Peel and dice all remaining vegetables. Heat 1 liter/1 quart mineral water in a large pot. 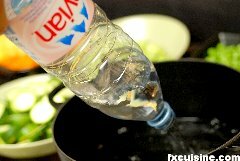 I don't drink much tap water but if you do use tap water. 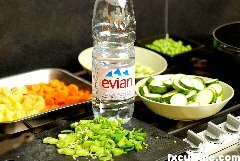 If you prefer mineral water, there is no reason to think it will be damaged by the vegetables. The water is the soup, so good water is better than chlorine-infused tap water. 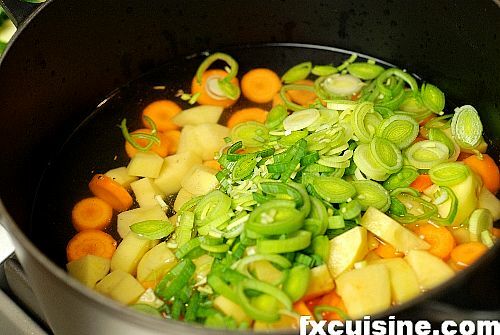 Gently put the vegetables in the pot starting with those that cook longest such as potatoes, leeks and carrots. Add a teaspoon sea salt and cover. 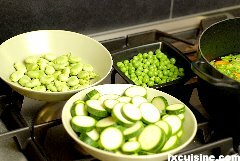 You need to coordinate the cooking time and I recommend you put you prepared vegetables in small bowls near the pot ordered by cooking time and use a timer to add more every 10 minutes. 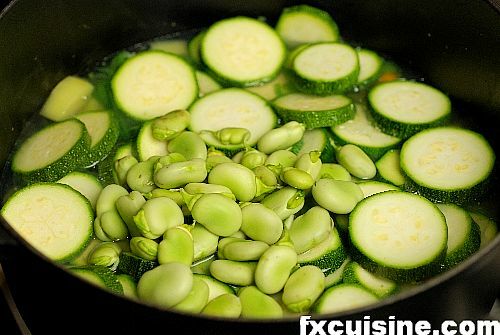 After about 10 minutes add the fava beans, the green beans and the green peas if using. 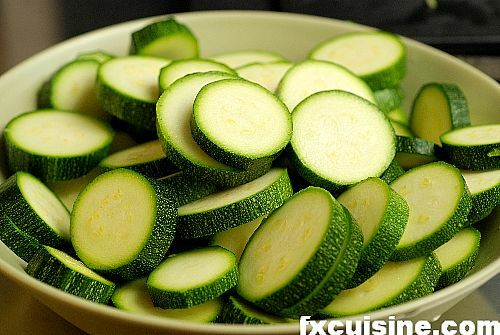 Boil for 5 more minutes, then add the zuchini. Cover and cook on a low heat for 15 more minutes. If using pasta, add the pasta about 10 minutes before the end or however much time is needed to cook it. Making proper pesto is an art that has many zealots. Before I fall prey to the pesto police let me say that I am not Ligurian and thus cannot offer final wisdom about this antique sauce. The basics of good pesto are nevertheless no more a secret. First, don't buy pesto in a jar or tube. Basil looses its fragrance after a day so guess what happens after 3 months on a shelf in rancid oil. Buy a nice bunch of fresh basil and if you can't use it the same day, just cut the bottom of the stems and put it in a glass of water. Otherwise evaporation would shrink the thin leaves within hours and leave you in despair. 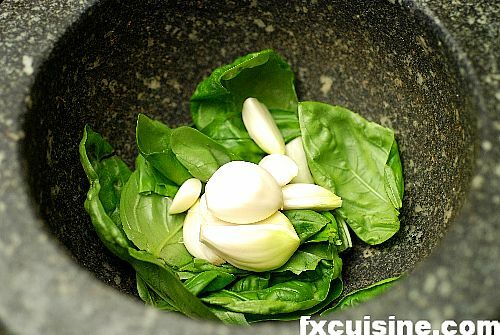 Some Ligurian cooks cut each basil leaf in three to remove the central stem. I recommend that at least you prick the leaves one by one and do not use the main stem. I do my pesto with mortar and pestle, but you can probably achieve reasonable results with a kitchen mixer. 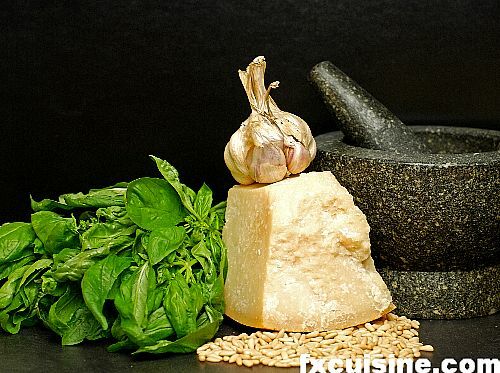 Pesto and pestle come from the same latin root, and in Italian cookbooks you will find phrases like "comminciate a pestare" - start to pesto. By using some electrical applicance you would be missing the fun and breaking the chain of the thousands of cooks who have made this great sauce with a mortar since the 16th century.